Advice from doctors, nutritionists and parents to eat fruits and vegetables remains with all of us, but that has not influenced the majority of people in the U.S. to eat that much of either. A new report released by the Center for Disease Control concludes just that. 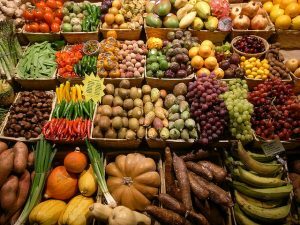 The report looked at the consumption of fruits and vegetables per state, with breakdowns by income, gender, race/ethnicity and age. Adults should eat between 1.5 and 2 cups of fruit and between 2 and 3 cups of vegetables each day. The report found that in all only 12.2% of people in the U.S. meet the recommended standard for fruit consumption, and fewer meet the standard for vegetables with just 9.3%. The comparison state by state did not reveal any top players in dietary action, but a few disparities were notable. West Virginia residents are at the bottom of the consumption rankings of all states for fruits at 7.3% and vegetables at just 5.8%. At the top of the list are Washington D.C. residents, who eat the most fruits at 15.5% and Alaskans the most vegetables at 12%. The evaluation using race/ethnicity showed Hispanic Americans ate the most fruits and vegetables at 15.7% and 10.5% respectively. White Americans ate the fewest fruits at 11.2% and Black Americans the fewest vegetables at 5.5%. By age, Americans between 21 and 50 eat more fruits than others at 13.8%, while those between 18 and 30 eat the least at 9.2%. For vegetables, those 51 and above eat the most at 10.9% and those again between 18 and 30 the least at 8.8%. By gender it was a runaway win for the women who eat more of both than men. Fruits were 15.1% for women and 9.2% for men, while vegetables were 10.9% for women and 7.6% for men. By income, a gap from high to low was substantial, with those earning the lowest income consuming the least amount of fruits at 11% and vegetables at 7%, and those at the high end consumed fruit at a 13% rate and vegetables at an 11.4% rate. The summary of the report is not full of good news. Despite positive health benefits through consumption of fruits and vegetables, findings in the report from the study are corroborate data that shows the vast majority of adults living in the U.S. consumed insufficient quantities, with less intake amongst men, younger adults and adults who live in poverty.